An In-Depth BSC guide to help you plan smarter. In their original book, The Balanced Scorecard, Translating Strategy Into Action, Drs. Robert S. Kaplan and David P. Norton opened with a simple metaphor for strategy: pretend you are entering the cockpit of a jet airplane, they asked of the reader. Now, what if you only had one instrument to measure your flight? If you only measure altitude, how do you gauge your fuel level? If you are only measuring your fuel, how do you ensure that you have a safe airspeed? Their point was that organizations need a full set of measurements to navigate complex competitive environments. Although it may seem strange now, when they initially published their groundbreaking book in the early 1990s, this was a fairly revolutionary suggestion. Then and now, organizations have a natural inclination to singularly focus on the bottom line, without a scientific approach to performance measurement across all parts of the organization. Drs. 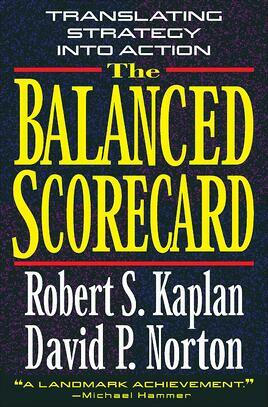 Kaplan and Norton’s solution, the Balanced Scorecard, coincided with the advent of big data, and demanded organizations look carefully at their internal processes to better execute strategy. In the current era of big data, where data is seamlessly integrated into how we think about organizational performance management, does the Balanced Scorecard still matter? You’ll have to excuse some bias here, but we believe that in the era of data analytics, the Balanced Scorecard is a more powerful tool than ever. At the highest conceptual level, the Balanced Scorecard is a framework that helps organizations translate strategy into operational objectives that drive behavior and performance. By blending both internal process and financial measures, the Balanced Scorecard creates a cohesive set of cause-and-effect relationships that touch all aspects of an organization’s performance. Due to its inherent flexibility, organizations use the Balanced Scorecard in a diverse set of applications including operational management, but it is best suited to clearly articulate, measure, and execute the major strategic objectives of an organization. As the bridge between operations and the strategic vision, the Balanced Scorecard has grown into a comprehensive strategy management system that can effectively synergize with other frameworks, such as Lean Six Sigma or Kaizen. Philosophically, the Balanced Scorecard plays well with others because it can adapt to any strategy or industry. Create an executable strategic plan with financial, customer, and internal process goals. Balanced Scorecards are part of a management system. What does that actually mean? The strategy map outlines the big picture direction of an organization, and often includes a mission or vision statement at the top as a reminder. The map is then typically broken down into four Perspectives that organize goals into inputs and outputs. Perspectives and their order vary across industry. Fundamentally, perspectives help an organization divide internal changes and their desired outputs. For example, a for-profit company’s perspectives may be Financial, Customer, Internal Process, and Talent and Technology. Think of the Financial and Customer perspectives as outcomes (visually, they sit on the top of the map to display that they rely on the Internal Process perspective). The Financial perspective can include goals and measures around profit. The Customer perspective can include goals and measures around customer satisfaction. The Internal Process focuses on strategic operational shifts, and usually contains the greatest number of strategic objectives. Process objectives tell the story of what your organization is going to do, . Lastly, Talent and Technology, also referred to as “Learning and Growth,” contains organizational objectives around attracting and retaining talent, and implementing the right systems. Public sector and non-profits organizations follow the same logic, although the perspectives are often reordered so that Customer or “Stakeholder” is the top outcome, and the Financial/Budget perspective might be at the bottom. Within each perspective, there are strategic objectives. Strategic Objectives are action statements that provide a broad strategic direction for the organization. A well-crafted Internal Process Objective might sound something like, “Execute proactive and consistent account management.” If that sounds a bit vague, hold on, we’ll continue to nail down exactly what that means with our strategic Initiatives and Key Performance Indicators. 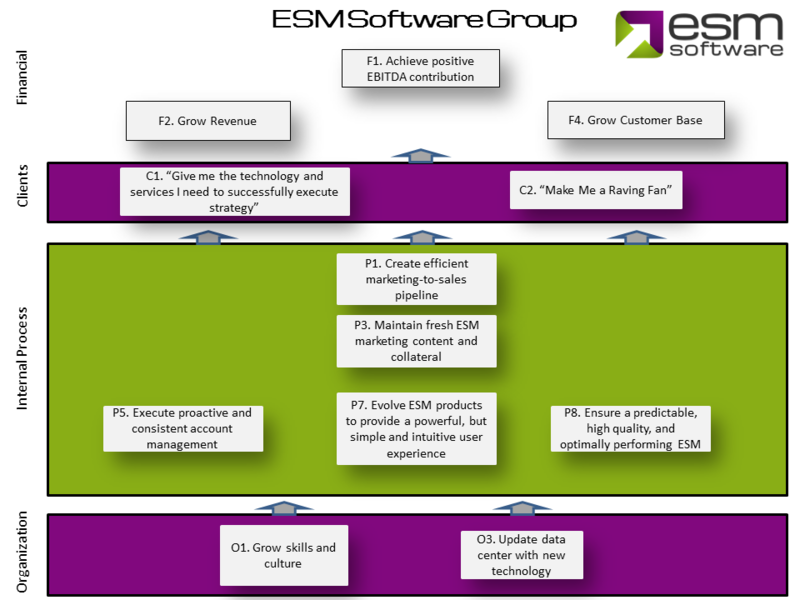 To give you an idea of a simple, best-practice strategy map, we’ve included our own ESM map below. There are few secrets here - we are a for-profit software company, so our top objective is to make money. Progressing down the map, the customer objectives take a slightly different form, as we phrase them in quotes, as the voice of the customer. The Internal Process perspective is composed of several product enhancement and account management objectives. Lastly, the Organizational (aka “Talent and Technology”) perspective focuses on our company culture and systems. Why is the objective important? How are we going to accomplish the objective? The strategy map, and its perspectives and objectives, are the starting point for a Balanced Scorecard. A comprehensive Balanced Scorecard will break down Objectives into Key Performance Indicators (KPIs) and Strategic Initiatives. The challenge for organizations is to find the critical 1-2 KPIs per Objective that tell a complete performance story, without diving into too much detail. To avoid diluting the cause-effect logic inherent to the BSC, I recommend organizations to not exceed three KPIs per Objective. If the Strategic Objective is what you are going to do, then the Strategic Initiative is how you’re going to do it. A Strategic Initiative is an investment of resources dedicated to accomplish an organizational Objective. They are clearly scoped change projects that close the gap between the current and desired performance levels. If you'd like to learn more about strategic initiatives, I recommend our blog series on effective initiative management. The beauty of the Balanced Scorecard system is that it provides strategic planners and leadership teams a clear lens to evaluate basic assumptions that were made when establishing the strategic plan. Let’s pretend for a moment that we have a situation like the one pictured below, where the ESM team’s client check-in KPI was way off (it’s not, I promise). 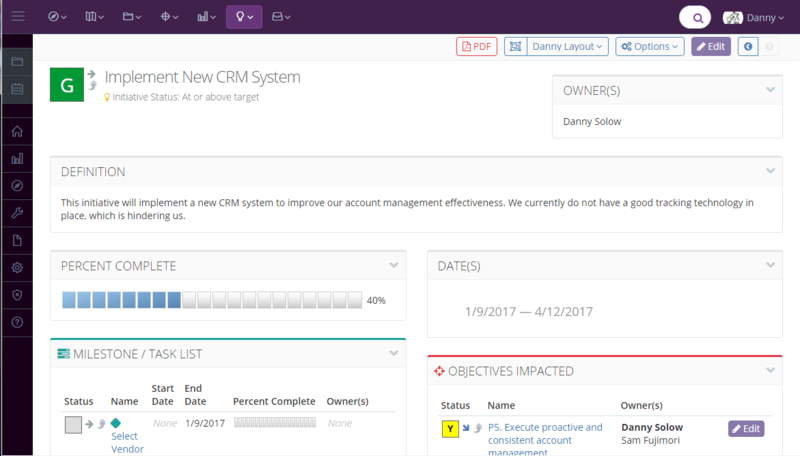 To extend the hypothetical, let’s say the Implement new CRM system Initiative has already been wrapped up and completed, and went swimmingly. Are we funding the right initiatives? Do we need to wait to see the results for this initiative? Do we have the right Initiative priorities? Is this Initiative linked to the appropriate Objective/KPI? Notice that all of these questions are focused on big-picture strategic concepts. This is the type of dialog that an effective strategy management system can create. The effort required to create a Balanced Scorecard can be wasted without the means to regularly review and adapt your Objectives, KPIs, and Strategic Initiatives. 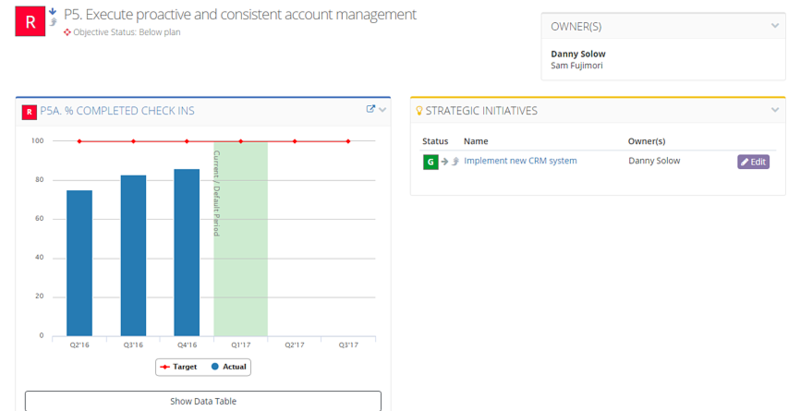 As demonstrated by the previous CRM example, the plan needs to adapt to new data. Strategy Review Meetings (SRMs) are a regular (commonly quarterly) discussion of BSC performance, key issues, and suggested course corrections. If you are creating a BSC and strategic management process, the SRM is where the organization will derive the greatest sustainable long-term value beyond communication and alignment. We write a lot about SRMs and how to most effectively construct and facilitate them, but the key takeaway should be that they are decision-driven meetings that focus on big-picture strategic questions rather than tactical issues. Creating an effective strategic management system, requires leadership buy-in, discipline, and lots of time in the beginning. We’re biased, but we strongly recommend considering a technology solution to help make all of this much easier. Manipulating hundreds of slides or spreadsheet lines can cause the BSC process to fail under the weight of its own version control issues. All organizations face challenges during SMS implementations. Ultimately, the advantages far outweigh any change management issues. The Balanced Scorecard provides an excellent tool to breathe life into the strategic planning process, continually adapt, and communicate the organizational vision. Start creating your Balanced Scorecard for today.